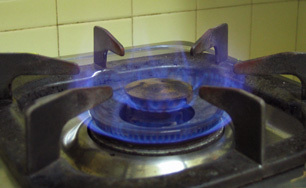 Natural gas consists primarily of methane. Methane (CH4) is the simplest of the alkanes, a family of compounds consisting only of carbon and hydrogen atoms. It's colorless and odorless—odor is added to make it detectable—and most often in the form of gas. It makes up 75% or more of natural gas used for heating, etc. It naturally dissolves in some groundwaters, especially near petroleum deposits or coal seams. Non-toxic, but can produce suffocation by replacing oxygen in confined air space. Can be absorbed into the body by inhalation. Flammable and potentially explosive when mixed with air. Can cause “water hammer” in plumbing systems or “fizzing” of water drawn from taps. When dissolved in water, it can give water a milky look, or “swampy” odor and taste. Atmospheric aeration is essentially the only treatment for methane in well water. Atmospheric aeration involves allowing the methane gas to escape to the atmosphere. Pressurized aeration tanks, though vented, will not work well for methane. Exposing the water in an atmospheric tank means that water pressure will be lost and a repressurization system consisting of a pump and usually a pressurized pump tank will be needed. Methane is not filterable or removable chemically. Prefilter to avoid particle or precipitate blockage of spray nozzles. Disinfection (typically chlorination) of aeration-system feedwater is recommended to avoid biofouling/contamination, especially in warmer climates. Aeration-released methane must be ventilated from tank to the outdoors with spark-free air blower fan, preferably operating 24/7.